Trump Selects Jovita Carranza To Head The Small Business Administration The president says he will nominate Carranza, who served as deputy administrator for the SBA under President George W. Bush, to replace Linda McMahon. 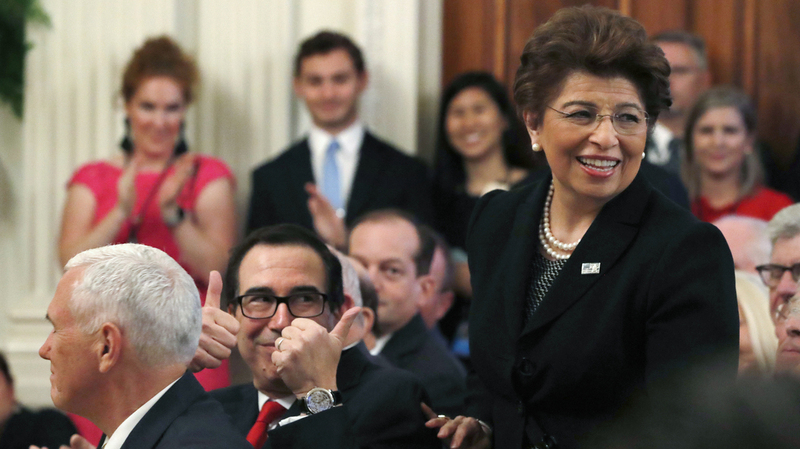 Treasury Secretary Steve Mnuchin gives two thumbs up for U.S. Treasurer Jovita Carranza in 2018. On Thursday, President Trump announced that he will nominate Carranza to lead the Small Business Administration. McMahon, who spent more than two years at the helm of the agency, reportedly plans to join the pro-Trump superPAC America First Action in support of the president's re-election campaign. If confirmed by the Senate, Carranza will be the highest-ranking Hispanic woman in Trump's Cabinet. In a statement, Mnuchin said that "Jovita's experience — including time as Deputy Administrator for the Small Business Administration — will be an asset to President Trump and the SBA, as they continue to promote pro-growth economic policies, eliminate job killing regulations, and fight for the small businesses that are the lifeblood of the American economy." Carranza also spent more than two decades at United Parcel Service, according to her Treasury Department bio. Starting as a night-shift box handler, she climbed the ladder to become president of Latin America and Caribbean operations and the highest-ranking Latina in the company's history. Carranza was born in Chicago to Mexican immigrants — a father who worked as a factory foreman and a housewife, according to Latina Style Magazine. Her mother reportedly read a newspaper every day to learn English. "Later in life, I realized my parents were the drivers of change, and their impatience with me taught me to be anxious about mediocracy," she told the magazine. "I thought if I could make it out of this situation — having an opportunity to acquire leadership and managerial skills; receiving on-the-job training — I would be able to finance higher education for myself; secure better caretakers and schools for my daughter — this is the American dream — what I strived to achieve, not looking back!"